Falcon Gauge Attitude Gyro provides a continuous visual display of the aircraft attitude with respect to the earth for maneuver around the longitudinal (pitch), and lateral (roll) axes, and yaw. A presicion AC brushless motor is featured in the electrical attitude gyro. The DC versions have a hybrid inverter which converts the aircraft DC to the required voltage and frequency for motor operation. The Power failure drops into view whenever the power is insufficient for operation of the gyro. 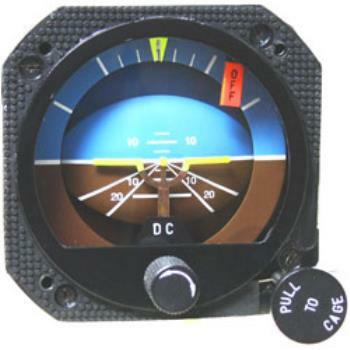 Electrical gyro can be caged by pulling the "Pull to Cage" knob. Power Supply: 14 or 28VDC Dimension: 3-3/8"x6.46/164mm Weight: 2.4lb/984g Vacuum type is standard air driven.